Let me start by saying that I’m not a craftsperson at all. Not. at. all. Glue and me don’t go well together, when using scissors the image ends up crooked, I can’t tie tiny knots or bows – my fingers just refuse to do what they should do.. in short: I’m NOT a crafter. In the past months I actually did some craft projects and I am happy with the results. Maybe that made me overconfident, I don’t know, but I’ve discovered several projects on Pinterest that made me think: Hmm… I can do that.. and I truly believe I can, cross-my-heart-honest! So to keep track of them I’ve put them together. As a reminder to myself and maybe a guideline for all of you who think: I will never get that done. Stop thinking like that, if *I* can do it, you can do it to! 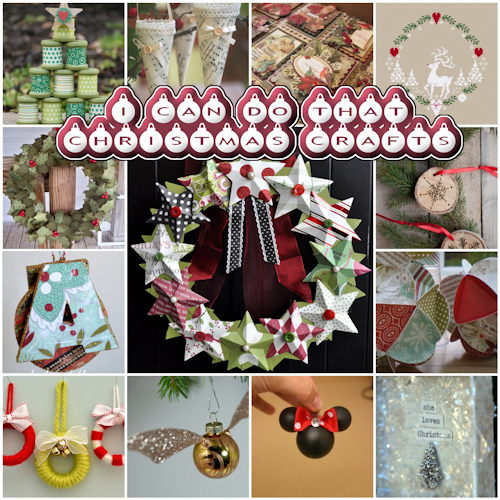 1) Gorgeous wreath made of 3D paper stars, designed by Little Birdie Secrets. With the very clear step by step photo tutorial, we will succeed! 2) Not too long ago I bought a bunch of spools, so when I saw the Spool Tree designed by Julie Bonner and featured at s·e·i LIFESTYLE I thought: I can do that. No tutorial but it’s a matter of glue and paper (uh-oh dangerous :D), I can do that! 3) These gorgeous cones come from a Hungarian Blog. I don’t know about you, but my Hungarian is a bit rusty. Seriously though, the pics speak for themselves. Brilliant idea, thanks Lavender Girl at Kifli és levendula. 4) This beautiful Christmas Sampler comes from Lynette at My Creative Affair. The fun thing is that I can look at this for inspiration, but all the images will be different. Finally a way of using all those bought-because-there-will-come-an-occasion-to-use-it scrap supplies. 5) There was a time – BC (before computer) – when I used to cross-stitch a lot. This one combines my love for cross-stitching and Christmas. I can cross-stitch, so that’s not the problem, now to find time! Great free pattern by Kissy at Kissy Cross. 6) What can I say, I love wreaths! This one from Kristin’s Kraft Korner is so festive. Looks like a lot of work – and I mean A LOT – but even if mine will look half as great as this one, it’ll be worth it. 7) I’m adding this one because we’ve actually made some of these already 🙂 Hubby had to cut some branches from a tree in our front garden and we claimed the branches, let them dry and then hubby cut them up in slices. We did the decorating with sharpies and paint. Hope to share some photos before it’s 2015. Head over to Amy Christie’s Blog ‘This heart of mine‘. 8) Great project for leftover scrapbook paper and embellishments. These initials come in all shapes and sizes, so there’s something for everyone. Use different papers for different occasions. Project by Amy at Mod Podge Rocks. 9) Another clever project for those leftover scrap-thingies. Good argument to use: No honey, I’m not buying more craftsupplies, I can use what I already have 🙂 Vicky at Blush Crafts created these paper baubles. Timeconsuming? Possibly, but look at the results!! 10) These mini wreaths are soooo cute! Could be done by kids too, I’m sure. So that’s a family project for the upcoming cold Winter nights! With a Blog titled: Smile Like You Mean It (each and every day) you can’t go wrong! Thanks Katie. 11) Ahhhh, The Golden Snitch! I fell in love, the second I saw it. Being a HUGE Harry Potter fan I had to include this one. Getting cold feet about my ability to recreate this but I MUST give it a try. Visit Gabriella at Tiny Apartment Crafts for a photo tutorial. 13) Beautiful Christmas Box by Beth Quinn Designs. I’m using this as inspiration, have to search my supplies to see what I can use. Phew, long Blogpost, but that’s to make up for the time I am MIA. 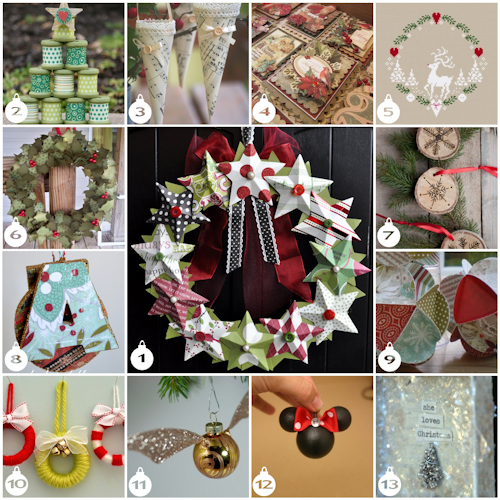 For more crafting inspiration, check out my Pinterest Boards. I’ve done a lot of crafting in the past, but I just can’t get enthused about it anymore. Maybe I did too much when I taught school, and then when the girls were little, and then with my Camp Fire group. It was fun, but I’m done. And I have to say, it’s kind of nice to not have glue and glitter all over the house. I don’t even do the scrapbooking anymore for all the photos I like to take. That’s a shame – I like doing it and I have all the paper and scissors and stamps . . .